How to import to Chile? Explain about import registration process, cargo movement to Chile from overseas countries, Import delivery process in Chile etc. What are the import procedures in Chile to move goods? 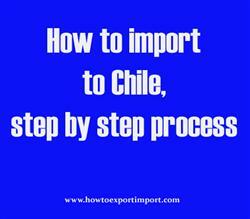 This post explains about step by step procedures that need to be finished with Chile government authority for importation to Chile. All natural persons or legal entities are approved to conduct export and import process in Chile. For commercial purpose, a registered trade with concerned license (if required) as per the business and have enlisted in the Trade and Company Register of the country is must for exporting and importing of products from and to Chile. An additional license is required for the importation of goods worth above 3,500 USD which is issued by the Central Bank of Chile. The importer must present an "Informe de Importacion", a document that must go through the commercial bank. The import documents should be arranged before the cargo arrives and make it ready for submits with the authorities. The document requirement is depends on the country of origin or destination. This post explains about different phases in import process that every importer needs to go through in Chile. Formalities for import to CHANARAL. Procedures to import to LIRQUEN. Procedures required to import to VALPARAISO. Requirements to import to TALCAHUANO. Clarifications to import to CHANARAL. How can I import to ARICA. What should I do to import to ANTOFAGASTA. How to import to ANTOFAGASTA Need to import to PUNTA ARENAS.? Explain to import to TALCAHUANO. Information to import to ARICA. Step by step process to import to Concepción. Methods to import to Easter Island. Guidelines to import to Antofagasta Please guide to import to TALCAHUANO. Help to import to CHANARAL. Printing machine error with customs - Un able to hand over documents to carrier. How to Import to Taiwan? How to Import to Finland? How to Import to Ireland? When does Sanitary Import Permit require in India?